Nobody really knew it until it was almost done. But nevertheless, it was happening. We were being watched. Laurel alerted me to this fact about a week ago. College students from Alberta, Canada have been reading her blog, and Jay's, too. How important is school in the lives of these students (as reported in their blogs)? What is their view of teachers and school? Positive? Negative? What is their view of your major (i.e., sports or languages)? What are some of the minor themes that you could identify? serving in the development of the student's identity? Are there any patterns that you have observed in your sample of blogs? Do you notice anything about language usage among these students? Any gender differences? You may organize your analysis as you see fit – e.g., by blog, by theme, by age, etc. Please note that you are NOT to contact any of these student blog writers. Wow. That's amazing. Jay and Laurel being selected to be a part of Set 7 just for being, well, normal teenagers! Granted, this could be considered an invasion of privacy, a concern that one of Laurel's acquaintances brought up. However, these blogs are public, so I guess they took that risk. 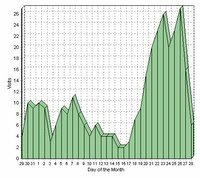 Nevertheless, Laurel's blog's traffic jumped in the second half of February as a result. In fact, she only found out by investigating the referring URLs to her blog from Canada. I mean, wouldn't you wan't to investigate how random Canadians were getting to your blog? All I know is I only got one Albertan hit from this whole thing...one lousy hit (22 February 20:44 ET). They came through Jay's blog, and only visited my homepage. Oh, well. I guess I'm not a normal teenager. But then again, we all knew that. darn! i checked the other sets (by changing the web address), and i'm not in any of them. dang. then again, i pretty much don't have anything in my blogger profile... no age, no location... no blog... then again again, if they did find mine, what would they think of it? Awww... I'll give you another hit. I work at the University of Lethbridge. Since I mentioned that I only got one lousy hit from Alberta, I've gotten five more...and a comment!!! And I'm on hit number 1499 right now...who will be 1500? I guess they're (informally) studing you too. I love being watched. I think it is great that people are going to see the way teens actually think. Although I don't really consider myself normal. Honestly I consider myself a bit odd compared to a lot of teens. But whatever lol! Hi Tim. This post was the very first one I read just after learning that I was your 6,000th hit! I was so surprised by your announcement that I was speechless for several minutes. Indeed, I found your blog yesterday (almost randomly after following a comment you left) and went thru all the posts backwards (until I discovered the Archive button). You might say "Why"? Mainly because I found it truly interesting, positive and well written. I also like how detailed you can go sometimes on various subjects. As for this post, the fact is that blogging is now part of our world. It is an amazing tool to discover mentality of other people in other countries. So, I'm not at all surprise that is has become material for university students. All in all, you made my day yesterday reading thru the good life of "normal" teenager (well you are almost off with the teenager tag and much more of an adult right now). You might be right when you say that you are not a normal teenager: you don't drink, don't get high on drugs, learned to spell correctly, use your multiple talents for the good and so on. I think that the US need more people like you simply. OK enough with the flowers, I have to go back reading the rest of your posts. Have a nice day.